Rev. Charles W. Pullett - June 1, 1935 - ? "In the year of 1897 the Rev. George H. Washington, pastor of St. Daniel M. E. Church, Chester, of the Delaware Conference, organized a few persons into a mission of St. Daniel M. E. Church. They met in a hall (brick) 2nd floor, 7th & Welsh Sts. One of the charter members survives yet, viz: Mrs. Sarah H. Christy. The Rev. George T. Fields was the first pastor from April 1897 to March, 1898. He moved them to a frame school house, 11th & Madison Sts. "The Rev. M. V. Waters was the pastor from March 27, 1898 to April 10, 1899. The Rev. S. S. Jolly from April 10, 1899 to April, 1901. The Rev. 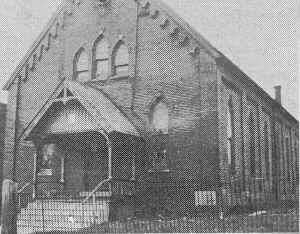 S. S. Jolly purchased the present Church (Siloam) from the 3rd Presbyterian Church (white) and led the congregation into it. It cost $3,000. The offer to the congregation for the church was $3,000, $1,000 down. The people raised $500, the Church Extension gave $300 and they borrowed $200." The following brief History of Siloam Memorial M.E. Church is taken from the Home Directory of the Colored People of Chester, 1906 compiled by Lawrence L. Barrett & C. I. Wilson. This reference is available at the DCHS research library. In 1895 a number of members of St. Daniel's M. E. Church living in the eastern end of the city petitioned that body to establish a mission convenient to their location. Rev. G. H. Washington, the then pastor of St. Daniel's M. E. Church, organized the same, with about twelve members. Rev. A. A. Parsons, a local preacher in St. Daniel's M. E. Church, took charge of the mission, remaining about a year. Meetings were held in a hall on Welsh street, above Seventh. Rev. George T. Fields, a local preacher in St. Daniel's, succeeded Rev. Parsons, remaining two years. During his pastorate the mission was organized into a separate church, and removed to Eleventh and Madison streets. Rev. M. V. Waters became the next pastor and remained one year. He was followed by Rev. S. S. Jolley, a most brilliant young man, whose impetus and influence will ever be remembered by the church, during whose two years' stay the present property was purchased from the Third Presbyterians at a cost of $3,000. At this time the church enjoyed its most prosperous period, spiritually and financially. Rev. J. R. Brinkley succeeded Rev. Jolley, and remained one year, being succeeded by the late Rev. J. E. Gunby, who died during the third year of his pastorate, the unexpired term being filled by Rev. Jose Angulo, a local preacher of Bainbridge Street M. E. Church. At the regular session of the Delaware Conference in 1905, the present pastor, Rev. A. F. Ennels, was appointed, and now entering upon his second year. Trustees - William Stevenson, I. J. Brittingham, F. E. Williams, E. R. Ringgold, Benjamin Warford, George Vincent, M. B. Faucett, secratary; J. T. Christy, treasurer; Philip Toulson, president. Stewards and Stewardesses - I. J. Brittingham, David Walmsley, Daniel Brittingham, G. A. Landin, Albert Maddox, F. E. Williams, District Steward, Georgianna Warford, Susan Handy, Edith Demby, M. A. Tunnell, Rosa Maddox. G. A. Landin, President Epworth League. � 2001, 2003 John A. Bullock III.